"I really don't know how you get this stuff done with three young boys. Honestly, you must never sleep!" And so begins the discussion I feel like I have had a hundred times. How does a mother of three boys find any time to knit, sew clothes, make a quilt? My short answers are the usual: I ignore my housework. I don't watch much TV. I like to stay up late. I have awesome parents who live in town and love to babysit. But it never explains the actual process a mother of three boys goes through trying to get a quilt finished. So today I'll let everyone into my world and document my attempt to finish a baby quilt for my three week old niece on Christmas Day. Knowing my brother and sister-in-law are expecting their first baby, a girl, around Christmas I decide to be really on top of things and make a baby quilt now. Find the perfect pack of charm squares and buy backing fabric. Complain about the heat and the exhaustion of taking three boys out the beach nearly every day. Say it's too hot to sew and spend hours lazily looking on Pinterest at the baby quilts everyone else has made. Back to school! Decide it's time to get organized since I actually have a few quiet hours in the day. Reorganize sewing room, bury baby quilt fabric in a pile and forget all about it. Exhausted from getting up at 5:30am five days a week, shuffling the boys off to school, teaching 20 hours a week and trying to organize my entire house, I pretty much stop making anything. I spend the month reading blogs and pinning everything on Pinterest, feeling crabby about my lack of quilting productivity. Seeing some great baby quilts online, I remember I have a baby quilt due in less that three months. Pat myself on the back for at least having the fabric ready. No one in the house seems to be going to bed at a reasonable hour. By the time they are all asleep I am too tired to, iron, cut, or sew. Remind myself to make sure I tell my husband I need a Saturday to sew. Realize that pretty much every single weekend in October my husband is working. Walk into my sewing room at least once a day and stare longingly at fabric. Decide to try to sew during the day. Work for ten minutes before boys come in and want to help. Somehow I end up back in the dining room with lots of paint and glitter. Declare Saturday a movie day and plan to sew. Put on the first movie and spend the entire time catching up with laundry. Movie ends and I realize I need to sew. Put on the second movie, head into sewing room and spend next 45 minutes cleaning off the sewing table, which was hijacked by the boys for art projects and legos. I get out fabric and realize I have no idea what kind of baby quilt I am going to make. Arrange charm squares for an hour, throw fabric back in a pile and go make dinner. My husband has two weekends off from work, I can quilt! No, I can't, as he reminds me he needs to finish repairing the garage. Oddly, he consideres this a more important job than a baby quilt. Sign up for a quilting retreat. In the piece and quiet of the weekend I piece two quilts together. I also get the baby quilt sandwiched and pinned. I tell my friends how I just have to quilt it and throw on the binding, so easy. I'm sure I will be done in a few days. Make a list of what I think I can actually knit and sew for gifts in time for Christmas. Plan a schedule out by the hour. Decide to get started on the knitting and plan to save the quilting and binding of the baby quilt, which according to my schedule will actually be done on December 23rd. I fall asleep every night with knitting in hand. I also notice I am quite behind in my gift making schedule. Notice that my four year old has taken out all the pins in the baby quilt. Put the whole thing back together and re-pin. I notice that the pins are out of the baby quilt again. I re-pin and hide the quilt this time. It's the 23rd. I have three pairs of pajamas to hem, two e-reader covers to cut and sew, and the baby quilt to quilt and bind. And a hat to knit. I hand the boys a stack of Christmas movies and feel invincible. I know this will be no problem. Whip up a quick eReader cover, save the quilt for another day and go enjoy an evening of Christmas movies with my family. Despite how much I wanted my sister-in-law to open up a beautiful baby quilt on Christmas morning, the truth is I already had finished up a sweater for my niece a few weeks ago; if the baby quilt shows up in January my niece will be none-the-wiser. Balance is a difficult trick, especially when you have a busy family life along with a strong creative drive. I'll admit it can be rough when the house is a mess, the boys are fighting and dinner hasn't even crossed my mind yet. That's when I go into my sewing room, let myself be mad for a minute, take a couple of breaths and let my mind wander. I pick up some fabric, make a few piles, get and idea or two. Usually, thinking of what I'd like to make clears my head enough, and I am able to remind myself that these moments really are fleeting and I want to be present. There will be time, there will always be time, just not right then. Maybe a late night burst of energy, a weekend away at a quilt-in, an afternoon alone while the boys head out to a movie with Dad. And that is how eventually, I will finish up this baby quilt. 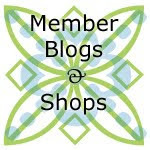 Becca typically blogs at Knittymama, if she can actually find the time. The Chilled Tones palette was the winner of the survey for our January Block Lottery. For a reminder of the basic rules of our lottery, please read our Block Lottery Page on this blog. We will be using this cool palette to construct Oh Fransson's Mod Mosaic Blocks. We will be using the white from the palette as a solid or tone on tone print for the grout in these blocks. Other fabrics can be solids or reads as a particular color. As you finish your blocks, be sure to add them to our flickr group and also the Oh Fransson flickr group. If you have any questions or need any clarification leave a comment and we will answer promptly...otherwise you have until our next meeting on January 17th to stitch up your blocks! This is my dad’s advice about what to do when you get frustrated. He let me in on this little gem when he gave me my first manual transmission-driving lesson in high school. Although there was never a second lesson and I still don’t know how to drive a stick shift – the sleep on it solution is a wise one. It really works! You’re wondering what all this has to do with quilting. Well, I’ve found that quilting is fun because it is challenging. Yet that can also mean that the challenges can be frustrating. For every new technique or tool, there is a learning curve and with that may come some tearing of hair, some choice words, or even some tears. I’m a new quilter. Around Thanksgiving I finally felt it was time to tackle my first big quilt project. Well – not that big. It’s a baby quilt for my husband’s pregnant niece; she’s due in mid January. So I picked an inspiration pic from Pinterest and drew out my quilt design in my notebook and figured out the size I needed for all the pieces. I patted myself on the back when I cleverly remembered to factor in all those pesky quarter-inch seem allowances too. I bought my fabric, with parceled out coupons, including my husband in the process with, “Which yellow, honey” and, “What accent color do you like?” For the back I stood in the Black Friday (actually Saturday) line at Joann’s to get some pretty, polka-dotted, gender-neutral Snuggle Flannel. I pre-washed everything and then pressed it neatly. With plenty of time on the books, I took care of Christmas presents first and rewarded my hard work with the baby quilt top, which turned out pretty well. I even paper pieced an itty-bitty schoolhouse block (my favorite) and fit that into the quilt label on the back. I documented this part of the process diligently with grainy Instagram pics uploaded to Flickr to brag. Satisfied, I used the quilt sandwich tutorial at Oh, Fransson! With just a little bit of trouble since I have carpeted floors and pesky cats and some super stretchy (and pilled!) Snuggle Flannel to deal with. (I stuck my cutting mat under the sections as I pinned them and that seemed to help.) Then I waited a bit…until a day I set aside just for quilting. When that day came, I first drew out my quilting pattern on my notebook quilt and picked a thread color for the top and another for the bottom and wound a couple of bobbins. Setting the stitch length to 3, de-linting the machine and putting in a new, number 90 needle, I did a test run with a scrap of batting and fabric which went well. Then I set my ITunes to my favorites and, brandishing my Hera marker, made the first few lines on the quilt sandwich. Rolling the right side up, I sat in front of my machine (which sits against a wall) and stitched about six inches out from the center of my quilt. Here’s where the point of my story comes in. The stitches were miniscule…so tight I wasn’t sure I would be able to rip them out without leaving a mark in the quilt top. Horrified, I stared at it, pulled it out of the machine and ran my test sandwich back through. The test sandwich came out fine with a second neat set of 3-millimeter stitches next to the first. Was the quilt pushing up against the wall too hard? Was the snuggle flannel too stretchy for the feed dogs to work? Was my machine not up to the task? I wasn’t sure what was wrong and I felt frustrated and suddenly angry that I had a deadline to meet and that my mother-in-law knew about the quilt so I couldn’t just pretend there wasn’t one when this baby came around. (I was considering throwing out the quilt! I was resenting an unborn baby!) Noting my increasing lack of reason, I turned off my machine, left my seam ripper untouched and took my dad’s advice. The magic of photo mosaic: It eliminates frustrating mistakes from the process! Everything worked without a hitch at her house. And I also found that I was so relieved about the whole thing that I was much more forgiving about my little stitching mistakes here and there (including the cheap flannel and that first patch of stitching which I never did rip out.) After all (my quilty friends remind me) this is going to be spit-up on and dragged around on floors and tossed in the washing machine a hundred times…the important thing is to stay calm and to see the project through. Although it’s not going to win any awards, it isn’t going to fall apart. And the best part is, the kid can sleep on it! That, my friends, must be the circle of life. I live in Falcon Heights with my partner Ross, two cats, and dog. I was born and raised here in MN, but moved to Vancouver, Canada 9 years ago when I went to graduate school for urban planning. From Vancouver, I moved to Houston where Ross took a job and we lived there for 6 years. Except for the job, great people and the quilt festival, we never really learned to love Houston and missed being near family. I took a job with the Minnesota Department of Transportation last year and we've been making the transition back "home" ever since. I grew up very close to my aunt who is an amazing sewer/crafter. She helped me make simple shorts and t-shirts when I was young and I would love to go to her house and pick out fabric and patterns. I continued to make things here and there as an adult, but started quilting about 5 years ago when a few things came together to lead me to the craft-- I got a sewing machine for Christmas, I discovered Denyse Schmidt's first book, I went to the Gees Bend exhibit at the Houston Museum of Fine Art, and I attended my first Quilt Festival in Houston. I got a free Sudoku quilt pattern from a Japanese quilt shop at Quilt Festival and set out to make my first baby quilt. I've only finished three quilts (number four is very, very close to a finish)! I have a lot of UFO's (including 3 finished baby quilt tops). When I moved to MN, I put them all in a very large bag and vowed not to start any new projects until these are finished. I didn't really keep my bargain, but I am plugging away. It's pretty erratic as I really have to be in the right mindset to quilt. I have a hard time sitting down to quilt if I have an hour here or there. I typically wait until I have large blocks of time, which sometimes never come. I made a baby quilt for a friend using the free Sudoku quilt pattern I got at Festival. It was pink and green and used the 40s reproduction fabrics, which I really loved before I discovered more modern fabric designers. Overall, I liked it, but really hated how the quilting and binding turned out. I can't find a photo, but I used the same pattern for my next baby quilt. I laugh now when I realize I used this same pattern 3 times-- I had no idea that there was a world of online quilt patterns and tutorials and inspiration until I joined the Houston Modern Quilt Guild in 2011! Goes to show what happens to a new quilter in isolation! I made a plus quilt that I called "stay positive" for my mom who has stage 4 breast cancer. It has been a bumpy road for all of us, and when I saw this pattern it was a good fit for what I wanted to convey by making it. Since we don't have kids, I have a spare bedroom that is my own. We just bought our house in July so I haven't done much to set up the space--except for shoving all of my fabric and notions in the closet. Luckily, the closet has these nice built-in drawers and compartments, so it's a really great room for getting the clutter out of sight (though it is by no means organized right now and finding things can be tricky). I hate to pay full price for fabric, so I usually buy fabric if I like it and it's on sale (with a vague notion of what I might do with it). I would probably spend less money if I only bought the fabric I need or really love and paid full price, but that would be too logical. I have most of my fabric folded in plastic bins, but that has spilled over into the general closet space of my sewing room. I love the potential of each new project and coming up with the idea for the quilt. I also find the patchwork rewarding as each new view unfolds. I dislike quilting, mainly because I'm usually disappointed with how it looks when I'm done. 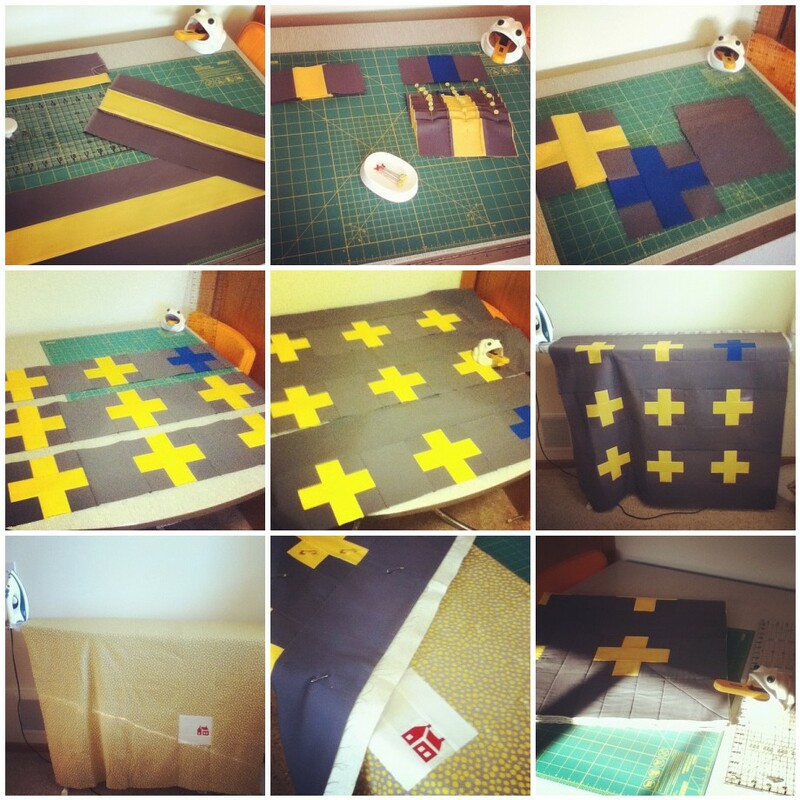 I want to start making minimalist quilts. I love the modern aesthetic of Yoshiko Jinzenji, but haven't had a chance to try this style yet and feel that the quilts I've finished so far are more traditional than I want them to be. This is partly because I haven't yet made anything for myself, which is another goal-- to be caught up enough on gifts to make something for myself! I also want to start free motion quilting. I just bought Angela Walters new book and am in awe. As noted above, free motion quilting. I'm afraid of it, but am halfway done stippling a baby quilt for the first time. I don't love how it is turning out, but decided I had to go for it because practicing on scraps is not the same as doing it on a quilt. I'm glad I did because I am learning a lot. I'm amazed at all of the wonderful talent that is out there, in guilds and on-line. It was really inspiring to meet Jacquie G. in September. Aesthetically, I'm most inspired by simple geometric patterns that are made modern through the use of negative space and irregular placement (or wonkiness). I'm really trying to work on not letting the perfect be the enemy of the good. Since most of my quilts are gifts, I have to remind myself that most people won't appreciate the "perfect" quilt and they probably won't see things like uneven quilt stitches and un-mitered corners. By pouring hours and hours into a gift, I need to give myself something back-- and that is not only the joy of quilting, but the opportunity to try new things and make mistakes in the process. I have two children, a son in college and a daughter who is a junior in high school. We have two dogs; Sadie (a Jack Russell wire haired) and Duke; a gordon setter. I work as an online history teacher for a community college in Southern California were we lived for 18 years. My family and I returned to Minneapolis after 26 years. I lived in Wayzata in the early 1980s and met my husband in the Twin Cities. At the moment I have a blog called Mingledfibers Studio. I am in transition with it at the moment as I have spent the last couple of years only quilting and knitting. Originally my blog was about just the yarn side of my life with knitting and weaving. I no longer weave and have returned to my roots of quilting and knitting. A name change and revamping of the site is in progress. 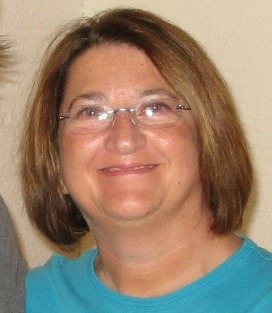 I am also going to try and pursue my passion for teaching in the quilting community and love to design. I have designed sweaters for years and I am back to designing quilts - I am currently collaborating on a modern design quilt for our brother. Knitting and training for a tri-atholon at the moment with my husband. 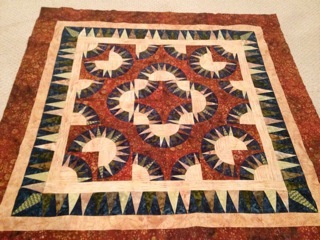 I have been an avid sewer all my life, however I began quilting in my early 20s - over 20 years ago. I learned to quilt at my LQS when we lived in Sioux Falls, SD. My first quilt was a blue and white delectable mountains that is currently on my sons bed. I have made about 15 quilts over the years. Hopefully this will change. I currently have 2 quilts that are UFOs - a challenge quilt due in January and a paper pieced quilt I started in anticipation for my son and his first apartment next year. I spend about 15 hours a week doing quilt related work. That would include designing, sewing and or cutting. 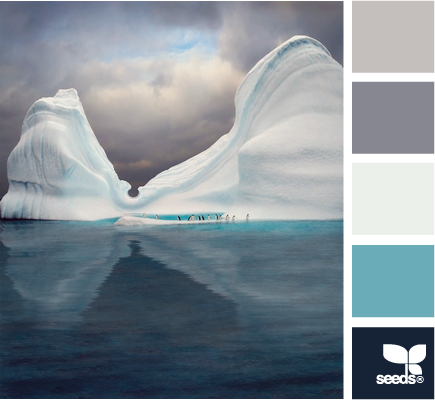 My first quilt was a blue and white delectable mountains. I had quilted a feather pattern on every mountain and the inside squares. It is currently on my sons bed. At the moment it would be the New York Beauty that if finished last year. It is done in all Batik's that are jewel toned. I have a space set up in an extra room that has become a small studio of sorts. It is truly my first space for my textile passion. I have bookshelves that I am able to display my yarn, fabric, and books on. I purchased a pre-fab butcher block from IKEA and white desk drawers for my sewing table top and work area. I just need a cutting table that is not my kitchen counter top for the space to be complete. Yes and no. I like to visit fabric stores all over the country, however unless I really love a fabric I usually don't buy to much without a design or idea of a quilt in mind. Some fabrics are just to good to walk way from -those are a must have. I have a small storage space, so this helps curb my spending habits. My favorite thing about quilting is spending time making something for people I care about. 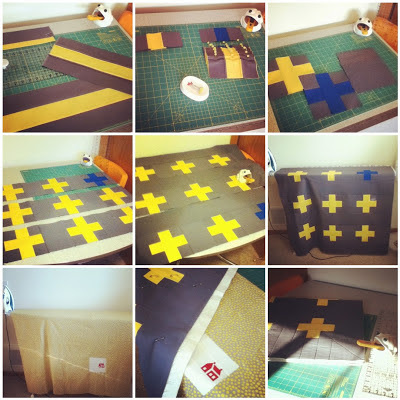 I love to design and see the quilt come together piece by piece. I really don't have a part of quilting that I don't really like. Finish a family quilt by the first of January, gather fabric for my sons best friend and make her quilt (the theme is cooking and desserts) as she will be graduating with a BS from Johnson and Wales Culinary school in 2014. This is a promised graduation present. Not really sure at the moment. I have always wanted to make a Judy Neimeyer quilt - I am taking a class at Blue Bamboo beginning in January to conquer this goal. However, I have paper pieced for years - just a little intimidated with her designs. Can't wait to make it!!!! Color and fabric. The idea of playing with different fabric and color is what inspires me. Also, making quilts for people i know. It is great fun designing and making a quilt that fits a persons personality. Be patient with yourself. Not every line is perfect and not every quilt is perfect. No matter how long we have quilted - we can always find something we wished had turned out differently. Have fun with the process. I am married to my wonderful husband of 22 years. My son is married and has two children and my daughter is also married. My two step-daughters are married and each have one child. All of our children live in the Minneapolis area. I have the best job ever - I am a retired grandmother! I grew up on a farm only ten miles from where I live now - our dream home on the lake. My hobbies are first - my grandchildren and then spending as much time as I can on and in our lake! Traveling takes up the rest of the time I'm not quilting, can't stand being away from my grandchildren or the lake unless it has hard water. I've been quilting for about 30 years but had sewn garments for years before that, so I thought sewing something flat couldn't be that hard. My quilt count is probably in the hundreds especially if I include doll quilts and baby quilts. I probably average about 20 - 25 hours a week sewing, not just quilting. My first quilt had HUGE pieces, puffy batting and was tied with yarn. One of my favorites is the Bricks and Stones quilt I made using Hope Valley by Denyse Schmidt. The pattern is by Red Pepper quilts and I modified it to not be asymetrical. I quilted it myself. I sew in our combined guest bedroom/office. I got a great storage cabinet a year ago that makes it so much better. Before that my fabric was everywhere as this room has no closet. I didn't really have a stash at all when I retired six years ago and now it is nearly out of control. For the past six months I have tried to limit my buying to only what I need to finish a project. New clothes and costumes for the grandchildren is the exception. I like most everything about quiling - the best is just working with pretty fabric and the worst is having to unsew something. My current goal is to finish three quilts in process and my long term goal is to start and finish a quilt kit (applique) gifted to me by my SIL as she decided it wasn't for her. I am working on improving my FMQ skills so I can quilt everything i make. I still find it difficult to quilt large quilts on my domestic machine. Rita of Red Pepper Quilts is my quilting idol. She has such precision piecing and eye for putting fabrics together. Many other bloggers also inspire me. Do what you love and don't be too hard on yourself. Belonging to a guild (or two) helps me to continue to expand my quilting skills. About 20 years ago I bought a used sewing machine. It was a Singer from the 1960's and had been used in a high school home economics classroom. It was sturdy, all metal, and made a perfect straight stitch. Over time, though, it seemed to loose it's oomph. Frustrated by the wobbly stitching and skipping, I decided the machine was a dud so I gave it away. But the machine wasn't at fault, I was. I knew NOTHING about caring for a sewing machine. During the 10 years I owned that old Singer, I had never once cleaned it, replaced a needle, oiled it, or had it tuned up. Looking back on this makes me cringe. Learn from my mistakes. Here's a basic guide to caring for and cleaning your sewing machine. Why do you need to clean your sewing machine? Both the fabric and thread running through your machine are constantly leaving bits of fluff and lint. This builds up over time in your feed dogs and in the bobbin mechanisms, impacting performance. Check your manual for directions on how to clean your machine. When you buy a new sewing machine ask the dealer to show you exactly how to clean it. If you don't have a manual or if you're unsure how to go about the task, ask a sewing machine repair person to walk you through the process. It's far better to ask than to avoid the task altogether. Compressed air, a lint brush, tweezers, special screwdriver for removing the needle plate, and a pack of fresh needles. Note: never blow into your machine to remove the lint as your breath will introduce unwanted moisture into the machine. 1. Turn off and unplug your machine. 2. Remove the foot and the needle. 3. Use a screwdriver or whatever special little tool came with your machine to remove the screw that holds the needle plate in place. 4. Remove the needle plate. 5. Lift out the bobbin and the bobbin holder. Gross! I can't believe I just cleaned this machine a couple weeks ago. 6. Use the lint brush to clean out the inside of the machine, especially around the hook race (the metal hook that catches the thread). Move the hand wheel around slowly in order to clean all the way around. Get into every little nook and cranny. 7. Dig the lint brush around the outside the bobbin area to capture the lint hanging out along the sides and near the bottom of the inside of the machine. Use tweezers to get into tough spots. 8. Use the lint brush or a pair of tweezers to clean out the built up lint in the feed dogs. 9. Wipe out the inside of the hook race area with a microfiber cloth or other clean cloth. 10. Carefully use compressed air or a vacuum to clean around the needle clamp and the foot holder. Make sure the air is blowing away from the machine and not into it. 11. Remove the dust and lint from the inside and outside of the bobbin holder (don't forget the bottom side, too). Once it's clean, insert the bobbin holder back into the machine. Make sure it's seated properly. 12. Replace the needle plate and screw it back into place. Put your bobbin back in, or just return the bobbin cover to its place. 13. Put a fresh needle in the machine and put the foot back on. Keeping your machine clean is important, but so are regular tuneups. To find a good repair person, ask around, make phone calls, ask questions. Plan on getting your machine serviced at least once a year if you put a lot of hours on it. If you sew infrequently, you can stretch it out to 1.5 to 2 years between tuneups. Local prices vary from $50 to more $100 for a basic tune up. Wait time also varies from one day to up to several weeks. If you don't want to wait forever, consider taking your machine in during a slower time of year, like January or during the summer. Repair people are typically busiest between Halloween and Christmas. A busy time of year for sewists! Some repair people are willing to negotiate if you're absolutely desperate to get your machine back sooner rather than later. Remember, call first and ask questions! If you know of other service providers in the area please feel free to leave their contact information in a comment. Rethread the machine. Incorrect threading can cause major troubles. Check the bobbin. Is it threaded in the machine properly? Did the bobbin wind properly or is the thread crossed and knotted? Make sure the needle has been inserted properly and is tight. Replace the needle if it's dull. If these three steps don't fix your problem, consult your sewing machine manual. Do not take your sewing machine apart. Do take it a trusted service professional. Most sewing machines made these days (but not all) are self oiling. If your manual doesn't include instructions on how to oil, personally, I don't think you should do it. This is all the more reason to bring your machine in a for regular tune ups - let the professionals worry about the oiling. I interviewed Dr. Willy for this blog post. One common mistake he sees is over oiling. After asking a few more questions, I discovered that I, too, have been over oiling my new mechanical machine, even though the manual tells me to oil it every 5 minutes (this is an exaggeration, of course, but they do suggest oiling with every use). From personal experience, all this oil has made a real mess. Oil has dripped out of the machine onto my fabric - aargh! And all that oil has blended with the lint to make a gooey mess in the bottom of machine. The moral of the story is to find a trusted professional to get good advice about caring for your sewing machine and to have it serviced regularly.